Most of us have a couple of annoying scars. Mostly they bring back memories of when you used to climb trees or skateboard. For others, they are a reminder of a surgery or accident you’d rather not remember. Lily-C™ Silicone Scar Therapy wrap could change all that. Simplylily (the makers of LilyPadz for breastfeeding mums) have launched this new product, initially meant to help reduce C-Section scars, but can also be used to reduce redness and discomfort as a result of operative, accidental and sports injuries. 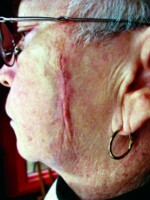 Silicone scar therapy is clinically proven in the prevention, improvement and reduction of scarring. The silicone provides a protective barrier which occludes and hydrates skin helping to encourage its natural healing properties. Lily-C™ is a skin like layer of silicone measuring 5cms x 22cms and has an adhesive free lining allowing it to gently stick to the skin without the use of irritating adhesives or additional taping. Lily-C ™ comes with LilyWash™ designed to gently cleanse Lily-C™ and renew the tacky lining allowing it to be used over and over again. Proper use of the Lily-C™ will soften, flatten and dramatically improve the appearance of your scar. This amazing new product can be found in Boots or online, RRP £34.99. 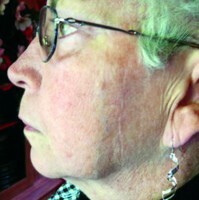 This entry was posted in News and tagged accident, operations, scar, scars, silicone, surgery by Editor. Bookmark the permalink.